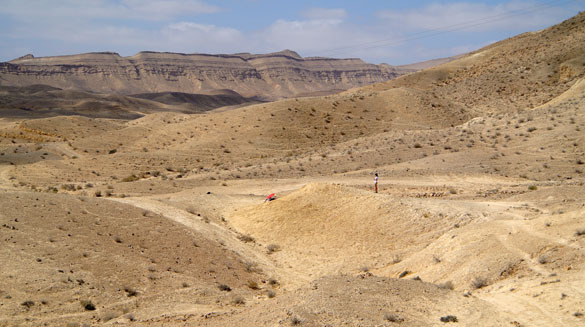 MITZPE RAMON, ISRAEL–Today the Wooster Geologists in Israel collected fossils from the Matmor Formation in Makhtesh Gadol. It was time to begin assembling data for Lizzie Reinthal’s and Steph Bosch’s Independent Study projects, and to follow up on some projects I have going in this Middle Jurassic set of fossiliferous marls and limestones. We do all our work as a team so that everyone is helping with everyone else’s project at some point. 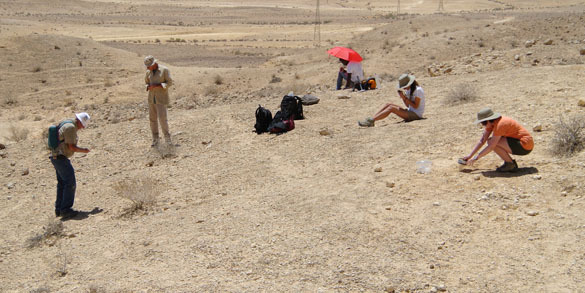 In the image above we have everyone at work picking up fossils at one outcrop near the center of the makhtesh (N 30.93369°, E 34.97588°, to be exact). Lizzie is working on crinoid taphonomy, which we’re approaching in a very systematic way. 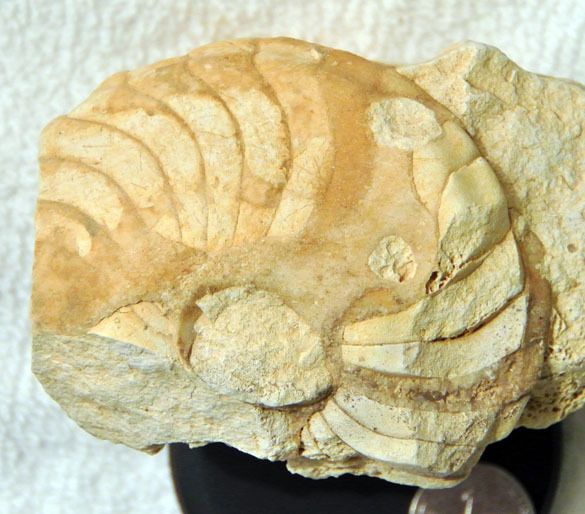 She laid out individual square-meter boundaries on her fossiliferous exposures and collected every bit of crinoid present, from single columnals (the disks that make up a crinoid stem) to partial calices (the crowns or “heads” where the feeding arms were attached). She even seived the sediment to get a sample of small fragments like those from the arms. This way we can assess how the crinoids were disarticulated and tossed about on the seafloor, and whether their stems had some characteristic detachment horizons. We are here in the Matmor Hills looking south towards the distant wall of the makhtesh. Two geologists are collecting from a yellowish marl. What do you think that small red dot is in the center? 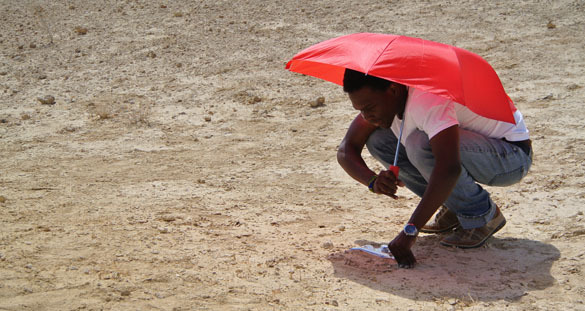 Why it is Oscar Mmari showing his flair for innovation! He brought the umbrella not for rain (that’s not going to happen here in July, for sure) but just for this. He isn’t much for hats, and we all must admit he had the best shade all day. So what did we find? I can show you only a few things because fossil photography in a hotel room is more difficult than you might imagine. (Can you guess what background I’m using?) 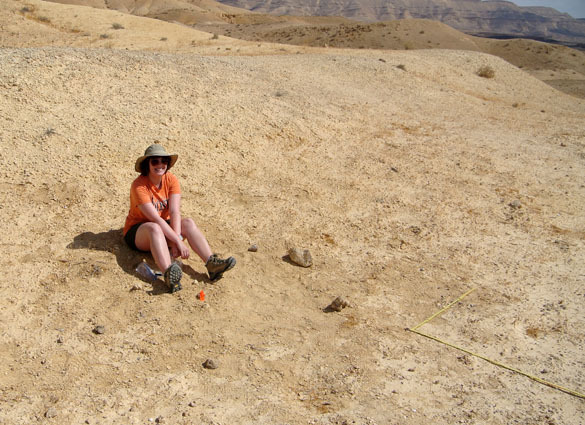 At one location in the Matmor Formation we collected every exposed echinoid spine in an attempt to statistically determine how many were bitten by some sort of predator. You can see that the spines displayed above have been chomped, probably by some sort of fish. 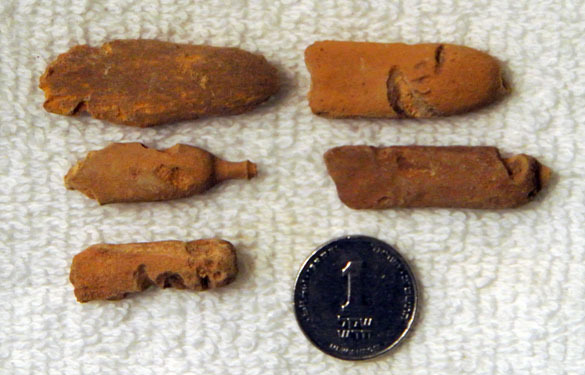 Spines like these were part of an earlier Fossil of the Week post. Keep looking Steph – most good things are worth working for.